Fiscal stamps were not usually sold to the public. So unless they were remaindered at some point and sold to the stamp trade, it is unusual to find mint examples. The 5 rouble was acquired in July 1906 from "G x Köhler". This stamp is particularly interesting because it already has a manuscript 25% reduced tariff inscription, suggesting that these were not applied at point of use but in whole sheets prior to use. 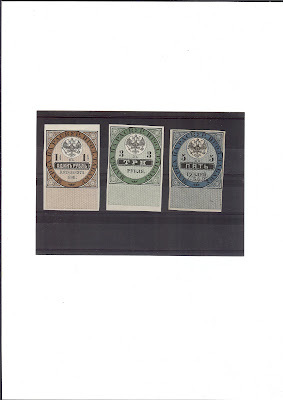 A very nice group of stamps!